All Solar System Periods Fit The Fibonacci Series And The Golden Ratio | Why The Phi? 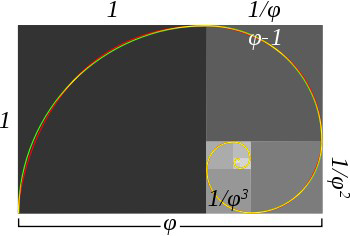 Home / News / All Solar System Periods Fit The Fibonacci Series And The Golden Ratio | Why The Phi? The following article provides a basis to support the notion of a very well organized and harmonic Universe. The Reciprocal Systems Theory of Solar Evolution provides for a system which is in reverse to the standard theories of today, but reflects many of the concepts within an Electrical Universe model. Modern day theories (which are accepted as fact) assert that stars form in nebula and accumulate their storehouse of stellar fuel during that time. Slowly that fuel is exhausted over the course of the star's life, eventually fizzling out to form a gas giant and eventual stellar death. In RS Theory, stellar evolution is reversed in that stars initially form as gas giants and accumulate material as they travel through the galactic disc, getting hotter and larger as time goes on. Within this model, the stabilizing factor for solar systems is time-space. Our solar system formed from a binary star system who went through several stellar rebirths. As material is gathered up the 2 stars get hotter and eventually there is enough mass accumulated to cause one of the stars to nova, which pushes some of the material at the core into time-space. This material helps to stabilize the orbit of the other star forming a harmonic relationship. Eventually the process occurs again, with the second star going nova, shattering its companion star into fragments. These fragments make up the core's of all the major planets, with the larger star fragment at the center of the forming solar system. Due to the highly energetic nature of time-space, these fragments are in resonance with the whole system and form discrete orbits. This theory also states that as the solar system continues to form, the core fragments within each planet have their own nova cycles which condense matter from the time-space region into space-time, expanding the planet's size as it 'cool', which explains why the Earth appears to have been expanding in size. Below is a research paper demonstrating that the planetary distances within our solar system are harmonically arranged within the golden mean ratio or phi. This fact provides a basis to support a very well organized Universe, in which the solar system experiences increases in harmonic frequency intensity as it passes through different regions of the galaxy, the so called 'photon energy' field discussed by many. Essentially as our solar system travels through the galaxy it gains additional matter and energy which entrains into the solar system increasing vibrational frequency and organizational dynamics as time goes on. When the sun has accumulated enough mass it will shift into a higher energy expression, getting hotter and brighter, which will reorient the planets, due to their stellar cores, moving them further out into the solar system. All of this suggests that the Mayan calendar and various other timekeeping systems may have tracked this process and proposed that the next steller shift in our sun is set to occur during this time in history. The so called ascension described by the Law of One material and many other works. Several insiders in the secret space program have also suggested that the government has known about this shift and uses Chemtrails with Aluminum to dampen the energetic entrainment process. Aluminum reflects and disrupts the coherent energies flowing from the sun to the earth, which provides even more evidence to support this model. Many other people have noticed Phi relationships in the solar system in the past, from Kepler onwards, and there are several websites which cover this interesting topic. But up until now, so far as I know, no-one has been able to find a single simple scheme linking all the planets and the Sun into a harmonious whole system described by the basic Fibonacci series. A couple of weeks ago while I was on holiday, I had a few long ‘brainstorming sessions’ with Tim Cullen, and decided to roll my sleeves up and get the calculator hot to test my ideas. What I discovered is laid out below in the style of a simple ‘paper’. Encouraged by an opinion from a PhD astrophysicist that this is “a remarkable discovery”, I will be rewriting this for submission to a journal with the more speculative elements removed and some extra number theory added to give it a sporting chance of acceptance. For now, this post establishes the basics, but there is much more I have discovered, and I will be using some of that extra material in more posts soon. The linear recurrence equation: an = an-1 + an-2 with the starting conditions: a1 = a2 = 1 generates the familiar Fibonacci series: 1,1,2,3,5,8,13… This paper will use the first twenty terms of the sequence to demonstrate a close match between the Fibonacci series and the dynamic relationships between all the planets, and two dwarf planets in the Solar System. The average error across the twenty eight data points is demonstrated to be under 2.75%. The scientific implication of the result is discussed. Since it was noticed that five synodic conjunctions occur as Earth orbits the Sun eight times while Venus orbits thirteen times, many attempts have been made to connect the Fibonacci series and it’s convergent ‘golden ratio’ of 1.618:1 to the structure of the solar system. Most of these attempts have concentrated on the radial distances or semi-major axes of the planet’s orbits, in the style of Bode’s Law, and have foundered in the inner solar system. The present paper adopts a different approach, in order to simultaneously study the dynamic relations between planet pairs as signified by the frequencies of their synodic conjunctions in addition to their individual orbits. A static analysis of semi-major axes is inadequate to an understanding of a dynamic solar system in the same way that statically balancing a flywheel cannot reveal the out of balance forces which will cause vibration when it is rotated at high speed. Additionally, the harmonic periods associated with the Power Spectral Density (PSD) study made of the sunspot number by talkshop contributor ‘Bart’ and used in the subsequent posting on Jupiter and Saturn’s relationship with the solar cycle and independently confirmed by Scafetta 2012a are included. The results are then compared to the descending values of the Fibonacci series and the deviations from the series calculated. 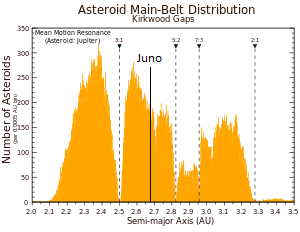 Juno is selected as representative of the Asteroid Belt as it lies near the middle of the main core at a distance of 2.67 AU. By Kepler’s third law this object has an orbital period of: P=(SQR)2.673=4.36yr. Results are tabulated in table 1. The hypothetically vanished planet ‘Vulcan’ is shown in order to demonstrate the interesting phi relationships which would have existed given its 2.67 year orbit. This is a startling result. There is no currently accepted physical mechanism which can explain the clear and strong link between the Fibonacci sequence, the dynamic motion of the solar system, terrestrial cyclic phenomena at around 60 years and 205 years and solar activity levels. The underlying ratio is Phi, known as the golden section or ratio. This ratio does manifest itself elsewhere in nature. In plant biology, Phi is well known to appear in the spacing of leaf stems and the packing of seed heads. The leaf stem spacing maximises sunlight exposure and the seed packing maximises abundance. In Geology, Phi relationships are evident in atomic, quasi-crystalline and other chemical structures. Space has no crystalline structure. However it does have gravitational fields and electromagnetic fields permeating it. What kind of interaction of these fields with matter could bring about a situation whereby, approximately 4.5 billion years after the formation of the solar system, such close relationships to Phi are found to link every planet and two dwarf planets in the solar system? Evidently, harmonic and other periodic perturbations between planets and planet pairs have helped shape the system, and continue to maintain its internal relationships. 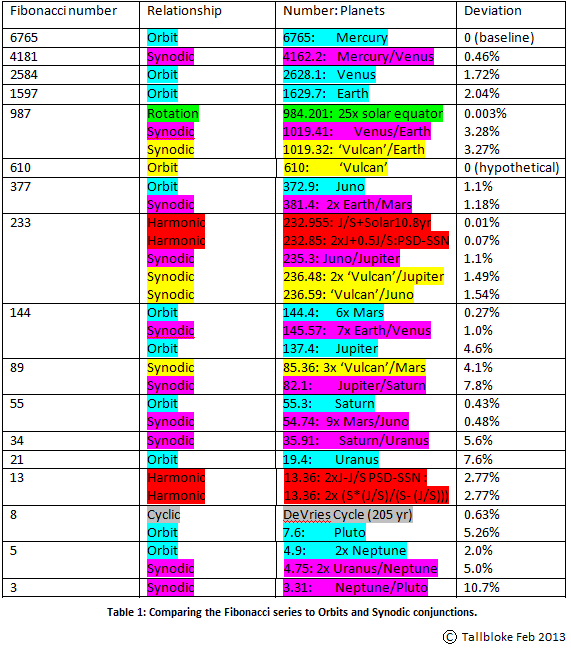 The average deviation from the Fibonacci series for the eight planets plus two dwarf planets orbits is 2.75%. This compares well with Bode’s Law which exhibits a 15% average deviation. Solar activity cycles are represented by the inclusion of results from a Power Spectral Density (PSD) analysis which finds sunspot (SSN) activity peaks at 19.86 and 23.72 years, generating harmonics at 10.8 and 122 years. This suggests that there is a link between planetary motion and solar activity levels. Because the Sun’s gravity diminishes on an inverse square law, perturbation between Jovian planets will affect their orbits more strongly than the inner planets. Consequently, the Jovian planets excepting Saturn show a bigger deviation from the Fibonacci series than the three innermost planets. It is suggested by Miles Mathis that inside Newton’s gravitational equation: F=GM1M2/r2 and Coulomb’s similar charge equation: F = kq1q2/r2 there is a unified field rather than two separate forces described by the two equations. Mathis demonstrates that with a minimum of postulates, a fully mechanical ‘pool ball physics’ can be developed. As well as providing a gravitational acceleration bringing extended bodies together, it also contains a repulsive electromagnetic force which although weak in our everyday experience, can become significant at the scale of astronomical bodies when they are in proximity. Importantly, the gravitational acceleration and the repulsive force scale differently as distance changes due to the different properties of the bodies they relate to. This may explain why empty viable orbits are free of formation debris; the changing of the planetary orbits to create the most efficient order has over time traversed and swept the solar system clear of debris. The exception is the Asteroid Belt between Mars and Jupiter. Some evidence suggests its formation may be recent (3.2Ma). Additionally, Mathis’ ‘foundational E/M field’ pervades space at varying densities (dependent on the proximity of emitting bodies), providing a ‘background’ against which the ratios of forces exerted by bodies will operate. Mathis suggests that rather than trying to understand Phi in isolation, we can only appreciate the way that the two quantities which form the ratio can operate mechanically, by understanding the way in which they are relative to the ambient field in which they operate. This is not a proposal for a ‘Universal Aether’, but for an interplanetary space which contains a density varying field of charge and spin bearing photons being constantly emitted and absorbed by matter. In a solar system with over 98% of the mass at the centre in a strongly magnetic star, and planets exhibiting Phi relationships in their orbital and synodic periods, this implies a relationship between Phi and the inverse square laws governing gravity and electro-magnetism. A true system contains cybernetic feedback. The Phi relationships demonstrated here are evidence that the solar system truly is a system in the full sense of the word. Bejan, Adrian (1997). “Advanced Engineering Thermodynamics,” (2nd ed.). New York: Wiley.